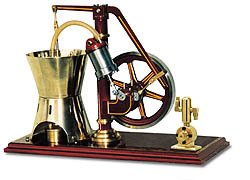 In the year 1878 D.W. van Rennes from Utrecht represented in Erfurt this hot air engine to the industry. We have copied this model, anxious to stay with care optically close to the original. In order to reach this the water cooling of the model had to be improved by a specially developed water pump. The copying requires a well equipped workshop. All indicated dimensions are metrical dimensions! flying wheel D-120 mm, number of regulations variable. The model is heated by spirit.